How much access do you have to a 3D printer? What would you do if you had weeks of time on your hands and a couple spools of filament lying around? Perhaps you would make a two second stop-motion animation called Bears on Stairs. An in-house development by London’s DBLG — a creative design studio — shows a smooth animation of a bear — well — climbing stairs, which at first glance appears animated. 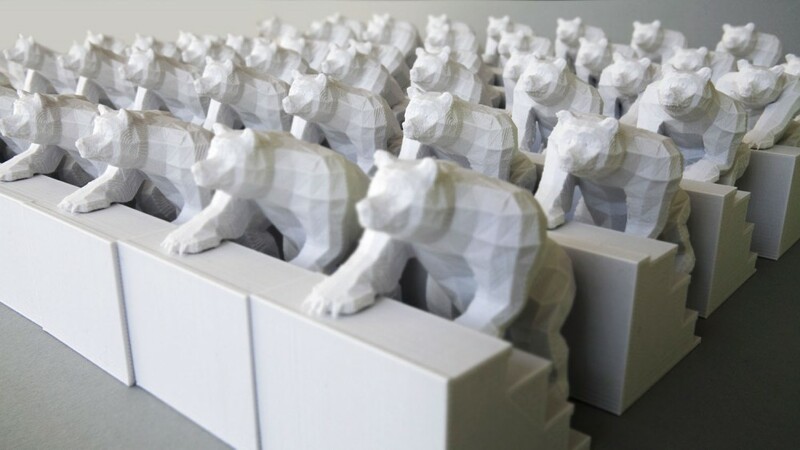 In reality, 50 printed sculptures each show an instance of the bear’s looping ascent. The entire process took four weeks of printing, sculpture trimming, and the special diligence that comes with making a stop-motion film. The heart of the project was to experiment, create, and — most importantly — have fun. So while these stairs don’t appear to go anywhere, in practice they flex and test the creative spirit inherent in any maker. Plus, the fusion of 3D printing and stop-motion make for pleasant viewing. If you want to check out a comparatively ‘feature length’ stop motion animation, check out The Rabbit’s Hole. Does the bear ever make it to the top off the stairs!? I can imagine a lot of very interesting art will be created using this. I’ve been watching for almost an hour and it’s still not at the top yet. Keep watching, it gets there at 17:56:40. Hours ahead of this comment. Does Sisyphus ever get that rock up the hill? Yes. Then it rolls over the peak, down the other slope, and stops at the foot of the next mountain. Finally, a practical use for a 3D printer. I could see a point to printing poseable figures for stop motion, I can’t see a point in printing each dang pose, I mean you’ve animated the models, why not just render from models at that point? I mean if you want to make the process slow and painful, just run lightwave on a rasberry pi under dosbox. But this is art! And it most probably goes to eleven. So it’s one better. Your absolutely right, but just for defecations and cachinnations (God I love online thesauri!) it’s a neat project. Because stop animation printed from a primitive 3d model is more interesting than a CG animation of a primitive 3d model. Anyway, it would have been even easier to just make no animation at all. Sometimes the point is to Just Do It. It’s like climbing mountains because they’re there and because you can. In practice 3D printing is used for faces and costume pieces. I’m not in the industry but I would imagine this gives more believable and cost-effective facial animation while preserving the soul of stop motion. See “Behind the Scenes of Kubo and the Two Strings ” on YouTube for a cool demo of the current state-of-the-art. If they wanted to make it slow and painful, they could just run *Blender* on *anything*. I feel for the bear. My life is rather like his at the moment. They could put them on the rim of a spinning disk and use a strobe light to give the illusion of movement in the physical models.